Looking for a great project to end Golding's classic tale of fear and savagery? 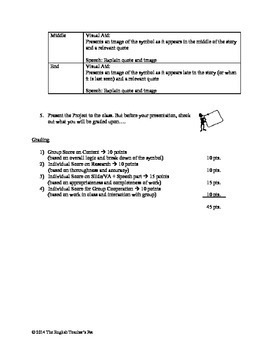 This download is ready to handout to students, as it explains your objectives, gives a step-by-step process to complete the assignment, and gives students (and the teacher) a rubric to assess progress with, all on two pages. 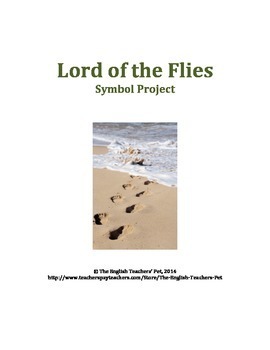 This group presentation, which can be done with two or as many students as you wish, asks students to find Symbolism in the novel Lord of the Flies, such as the Beast, and to give quotes, define its role, and define any changes the symbol may incur as the novel progresses. A visual of the symbol, a quote, and an explanation is expected for any symbols, and can be done with any media, from PowerPoint to simple pencil and paper. 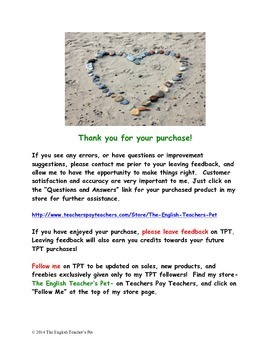 I use this project before I have my freshmen write up a short symbolism essay, but the assignment can stand alone. 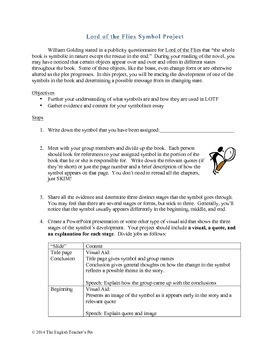 Students should have read the entire novel before attempting the assignment, but it could be used after you come across symbols in the readings.